The SLIFHDMIT21TM28 provides a complete single-link HDMI transmitter function complies with HDMI specification version 2.1. 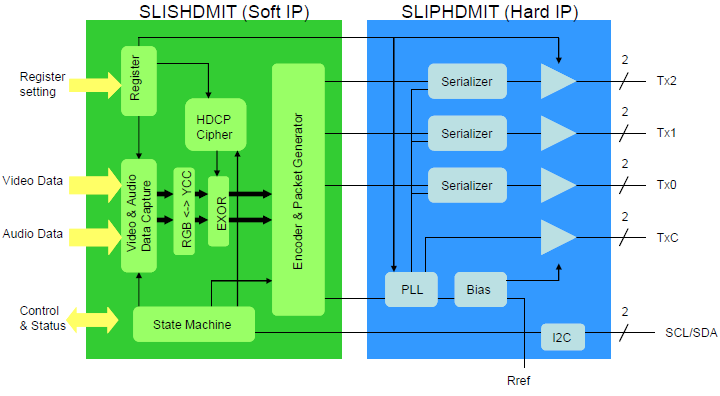 The SLIFHDMIT21TM28 consists of two modules, a physical layer (SLIPHDT) and a link module (SLISHDMI15T). The PHY is upper compatible with DVI transmitter, and implemented as a hard IP based on an TSMC 28nm HPC+ process, while the link module is implemented as a synthesizable soft IP. Built-in High-bandwidth Digital Content Protection (HDCP) cipher function protects the transmission of audiovisual contents.